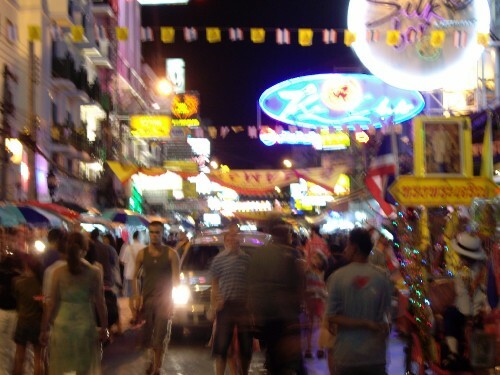 Firstly a few short words on Bangkok. Bloody great city - a true big city and another massive culture shock coming from Laos. I've stayed at Khao San road - the backpackers mecca of Asia. I like nothing better than getting some Pad Thai, a beer from the 7/11 and sitting on the kerb and watch the circus: vendors, beer girls, ladyboys, tuk tuk drivers, goths, expats with their 'holiday' girlfriends (way too young, way to gorgeous and way outta their league), goths, buskers with mobile karaoke units, locals dressed in any number of fashion from the past 20 years, backpackers fresh off the plane (eating in resteraunts, clean clothes, air con hotels), backpackers about to leave (dirty clothes, sunburnt, eating on the kerb...) and the most pimped out tuk tuk I've ever seen. Its nothing like the rest of Bangkok but it's still cool. Now the main event: I'm sitting here recovering from my first Thai massage and waiting for my flight to the next continent and trying to process the past 2 months. I could go home now happy with everything I've done so far (but thats not gonna happen - I'm more excited about the next stage more than ever). What's really surprised me is how much its made me appreciate everything we have back home, things like personal space, flushing throne toilets, conversational English and variable weather (all the Tasmanian's can roll their eyes at that one if you like!). I never mentioned it on this site, but there were a couple of times when I just wanted to get the hell outta here and back to civilisation. I can't really pick what would trigger it cause it wasn't the obvious things (sewer fall, spewsies etc), but it lessened with time - I don't think I ever got it after I got into Laos and now I'm just thinking about all the things I'm going to miss like (here comes another list): tasty and cheap food and beer, tropical fruit grown in the tropics (don't think I'm going to be able eat pineapple back home now), kids untouched by TV and playstation and bargaining with stall holders/winding up greedy tuk tuk drivers who don't lower their prices. I sort have got an idea of what it's like to be a celebrity - why Michael Jackson is bonkers or Madonna looks so bored during interviews. Not being able to go about your daily life without being harassed and being asked the same question over and over and over again really gnaws at you. All those pissed of at paparazzi photos make a lot of sense now. Anyway as you can guess I've had a ball so far - this is definately part of the world I'll be heading back to sometime, heads up to work - theres a good chance I'll be looking for some leave without pay again in the future! OK enough misty eyed introspection, the next post will sound a lot more like the Patrick (most) of you all know - I need to vent on some of the other tourists I've met so far.